Expand your macbook with HDMI, VGA, Ethernet, 3 USB 3.0 ports, TF SD card reader and one type c PD 3.0 charging port. 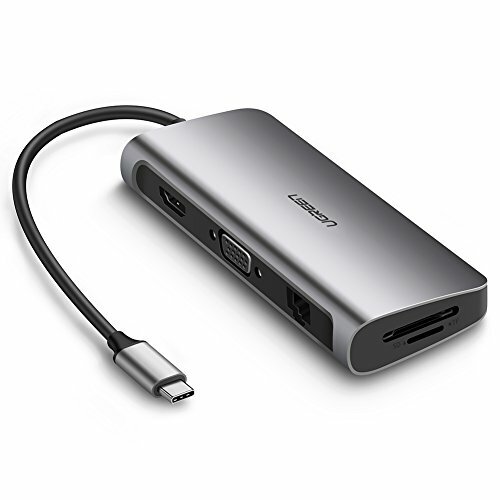 HDMI port provides simple plug-and-play connection to a second display or monitor at resolution up to 3840x2160@30Hz; VGA port provides MAX 1920x1080@60Hz 1080P video output. Enjoy movies with your family on bigger screen or make a vivid presentation in a meeting. NOTE: HDMI and VGA ports can NOT be used or connected at the same time. Support PD 3.0 charging at max 20V 3A, this Type-C pass-through female port can quickly charge new Macbook or other USB-C devices based on PD charging protocol for power supply. USB Type C hub adds extra 3 USB 3.0 ports for your laptop, allowing to connect multiple USB peripherals. Support faster data transfer up to 5Gbps, 10X faster than USB 2.0. Type C card reader easily expands SD and TF slots to your PC. 2 cards reading simultaneously keep you away from the hassle of constant unplugging and re-plugging. Equipped with a RJ45 port, this USB Type C Lan network adapter supports 10/100/1000Mbps network connection, ideal for streaming movies, downloading large files or playing games. 2. Please do NOT use USB 3.0 ports for charging. 3. For 4K resolution, pls keep HDMI cable within 5M. MULTIPORT CONNECTION: UGREEN USB-C hub easily expands your USB C (Thunderbolt 3 compatible) enabled Mac with HDMI, VGA, 3xUSB 3.0 port, SD TF card slot, 1000 Mbps RJ45 Ethernet port and 1 Type-C Power Delivery 3.0 charging port. ★NOTE★ This product only works for devices which support USB C DP Alt mode. Please check your device before purchase. POWER DELIVERY: Support PD charging at max 20V 3A, this multi port USB C adapter provides one Type-C pass-through female port by which you could securely charge connected new Macbook or other Type-C laptop. NOTE: Total maximum power output is 60W of PD charging and it reserves 7.4W for this adapter itself when working. EXTENSIVE COMPATIBILITY: Work perfectly for Apple 12 inch new macbook, MacBook Pro 2017 2016, Google chromebook, Dell XPS 13 15, Lenovo Yoga 900, HP Spectre notebook, ASUS ZenBook3, Huawei Matebook, Samsung Galaxy S8 S8+ S9 etc. REMINDER: Compared to plastic case, aluminum case has better thermal dissipation which means heat occurred inside would be conducted to outside more quickly, making this adapter safer but hotter (which is normal) than plastic case.